Sponsor Ian Bushnell of Mentor International joins Phairoj Phatsorpinyosakul, President of Tantraphan Supermarket; Peter Smith of AA Insurance and head of the new Northern BCCT discusses the BCCT, Shana Kongmun Managing Editor shares a drink with Gai Kelly, and Rob Kelly is joined by his wife.Center: Daniel Pruce (left) joins Graham MacDonald for the presentation. 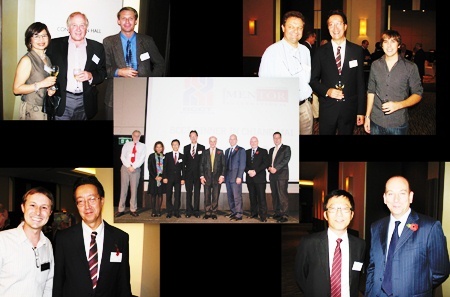 The establishment of the British Chamber of Commerce of Thailand (BCCT) first Northern group kicked off at a dinner sponsored by Mentor International Chiang Mai at the Le Meridien on November 11, 2010 with a visit from Deputy Head of the U.K. Mission, Daniel Pruce and Chairman of the BCCT Graham MacDonald discussing Thai politics and the economy and its effect on British expats. The BCCT was established in 1946, and Mr. MacDonald noted it is the oldest Western chamber in Thailand with 2200 representatives and 660 companies of which 18 members are in Chiang Mai. The BCCT aims to help members develop their businesses in Thailand through marketing help and public relations, they offer seminars in the Thai language as well. The BCCT deals with advocacy issues on visas and work permits, property rights, the foreign business act and U.K.-Thai trade initiatives and are in the process of setting up regional centers to stimulate business contacts around Thailand. One of the major concerns for most expats in Thailand is the strong baht, which Mr. MacDonald had to inform the crowd that given the fundamentals of the Thai economy, the inflow of Asian funding and the weakness of Western economies, that he did not see the baht getting weaker any time soon. Mr. MacDonald noted that while foreign direct investment has continued to grow, doubling from the same period last year, it is from existing companies in Thailand and that new investment has almost entirely halted. He said, this shows that those already in Thailand understand the situation isn’t problematic to investors but that new investors aren’t as aware. He added that while the political turmoil has harmed Thailand in the short term, he felt that the brand has not been damaged permanently. He added that while western companies have balked the Japanese and Chinese continue to grow their investments in Thailand with Japan being the largest foreign investor in Thailand. He noted that despite the political disturbances that tourism is actually on the rise and that economic stability remains robust, inflation low and the unemployment rate at a rate that western nations envy. That, and a low public debt and a healthy savings investment on the part of the population have led to Thailand being the second largest economy in ASEAN. Indonesia is the first. Deputy Head of Mission Daniel Pruce then took over the podium to discuss the political situation, noting that the divisions present in Thailand have proven that they can bubble up to the surface and result in demonstrations and violence as has been seen in recent years. “The risk remains that it will happen again unless Thailand can tackle these divisions,” he added. He added that in discussions with Prime Minister Abhisit, it has been made very clear that the Prime Minister recognizes the need to work with all the voices in Thailand. Mr. Pruce noted that while Thailand needs to address internal issues, they also need to work to rebuild confidence in Thailand, commit to human rights and media freedoms, noting that Thailand had slipped dramatically in the Press Freedom Index to 153 last year. Finally, he discussed British interests in Thailand, noting that it is the number one long haul destination for British tourists. “British citizens in Thailand have very high levels of deaths, injuries and arrests, as well as more births registered than any other Embassy.” He noted that last year the British Embassy issued 48,000 visas. Guests questioned Mr. Pruce on travel advice given during the unrest and he noted that while travel advice is carefully considered by a team of experts at the Embassy, and they are mindful of the impact, ultimately their main concern is the safety and security of their citizens. While an hour or so of discussion, it was packed with information and many walked away from it with a better understanding of the BCCT and the Thai economic and political situation. 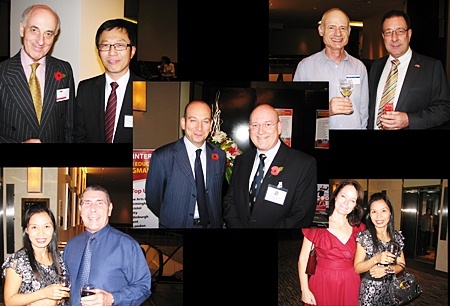 For more details of the British Chamber of Commerce Thailand please look at their web site : www.bccthai.com or email the Northern Thailand Chairman : [email protected]. Clockwise from top left, Joe Lynch and his wife are joined by Richard Abbott of BJC Foods; Marc Dumur, President of Skal chats with British Honorary Consul Ben Svasti Thomson and Ben Brandeis; Phairoj Phatsorpinyosakul, President of Tantraphan Supermarket chats with Daniel Pruce, Deputy Head of Mission; Dave Matthews of Digital Zoo shares a drink with Ben Svasti Thomson. Center: Speakers, sponsors and BCCT members join Daniel Pruce on stage after the presentation. 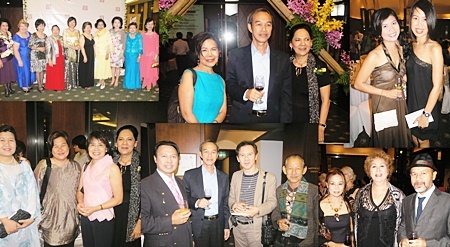 The Chiangmai Gymkhana Club was the scene of a wine tasting hosted by Citylife and with wine supplied by the Wine Connection. Pim Kemasingki welcomed the group to tables set under the huge old tree in the Club’s scenic gardens. Pim hopes to continue to offer these events at various venues around the city by offering tasty, affordable wines. 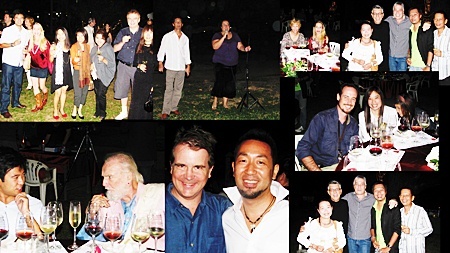 Photos here show the well attended event with a diversity of visitors, from Riddhi Diskul of Le Crystal rubbing elbows with Chiang Mai icon Dr. Howard to Duengpen (Boong) Chaladlam of Chiang Mai Friends, Julie Hastings, John Nadeen and more. The Zonta Chiang Mai Club organized its 13th annual fund raiser October Moon Dance on October 29, 2010 at the Imperial Mae Ping Hotel. Over 200 people attended the grand gala evening that was also the celebration of the 14th anniversary of the charter of the Zonta Chiang Mai Club. The charter president, Mrs. Soomboon Suprasert, was in the audience at the VIP table. The Zonta Club President, Mrs. Jiamjit Boonsom, announced the club was able to raise over Baht 150,000 through ticket sales, private donations, silent auction and cash bar revenue. Dr. Chao Duang Duen na Chiang Mai, a long time trusted advisor of the Zonta Chiang Mai Club, graced the VIP table as well as Deputy Governor of Chiang Mai Chumporn Sangmanee. Entertainment by the Dang Fantastic Band kept everyone on the dance floor. Ana Gracey and her band performed at the cocktail hour. There were several talented singers on the stage while a waltz and tango were performed by Aree Burchard and her partner. Two graceful hula hoop routines were performed by Ms. Gina Guerreiri, an exchange student from the USA currently studying at Payap University. The directors of the newly opened Vivo Danza dance studio, Peerpapong Pongpaiboon and Paweena Pongpaiboon performed the exciting ‘Vivo Salsa’ dance and later they led the audience in a Latin line dance choreographed by them especially for the Zonta event. Many very kind and talented people volunteered with entertainment and stage control. During the evening, Mrs. Ampai Sheehan, director of Ampai Institute and a former Zonta member, donated a scholarship for one of the young women in the Zonta Life Skills Leadership Program. The Zonta club members will select the young woman to receive this education opportunity. The scholarship is valued at Baht 40,000. As the party was closing, Mr Jankaew Kittipanya,a long time employee of Boonsom Spirulina Farm, turned in a ruby ring valued at Baht 48,000. he had found on the floor after it had fallen to the carpet during the silent auction. Anyamanee Jewelry awarded him for his good citizenship for turning in the ring. The amount raised will enable the Zonta Chiang Mai club to carry on their four programs:Zonta Adopt an Orphan (ZAO), Life Skills Leadership Training for Adolescent Girls, Zonta Health Village and financial donation to aid abused women in the community. The Chiang Mai Zoo has come forth as a partner to arrange a visit for the children in the ZAO group for January 2011. Women residents who would like to know more about Zonta Chiang Mai Club can contact the Secretary, Mrs. Margaret Bhadungzong at margaret @chiangmai-chiangrai.com.